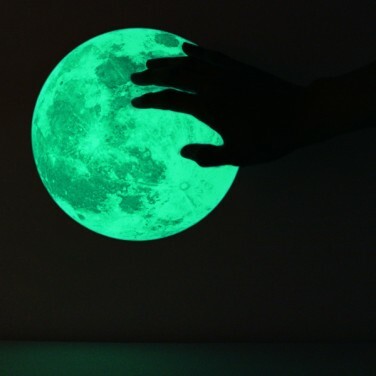 Brighten up your child's room at night with beautifully decorative glow in the dark moons. 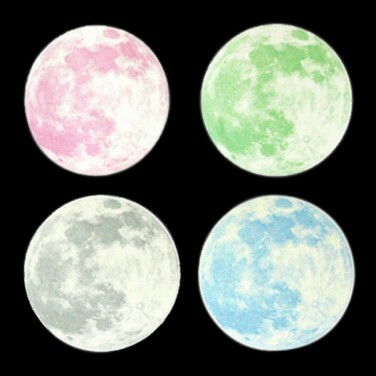 A pack of factually correct glow moon stickers make a stunning and subtle nightlight for your child's room. A stunning pack of glow in the dark moon stickers, this pack of six Clair de Lune glow moon stickers feature real images taken of the moon by astrophotographer Norbert Rumiano in Nantes, France in 2005. 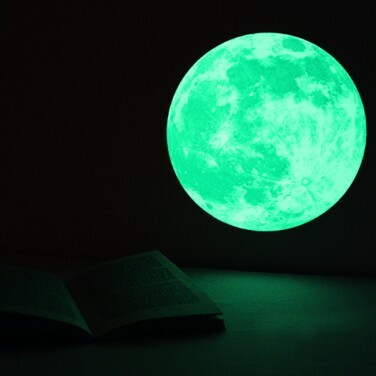 Available in pink or blue in the daylight, the moons glow green in the dark to provide a gorgeous night light that's as enchanting as real moonlight. Perfect for kids rooms now matter how young or old to provide comfort and magical light at night. Get your bedroom glowing with these glow in the dark shapes and stars, these funky and cosmic shapes can even be attached to books and bags. Small glow moonlight wall stickers feature real astrophotographic images of the moon and glow brightly in the dark. Perfect for decorating kids rooms as a comforting nightlight or as part of a larger design. Create beautiful glow in the dark room features and striking wall art in your child's room with a super large Clair de Lune glow moonlight wall sticker. A fun and unusual way to give your child the comfort of light at night.